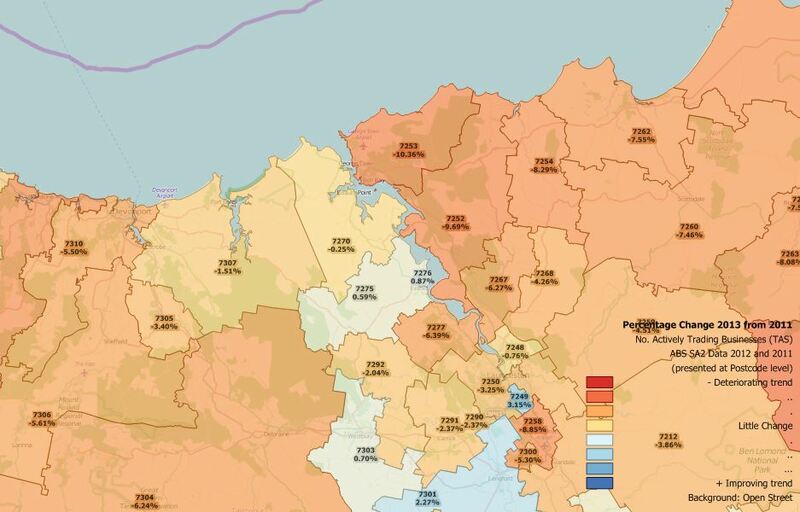 Northern Tasmania, centred on the regional city of Launceston (postcode 7250) and comprising parts of three marginal Commonwealth electorates – Bass, Braddon and Lyons -, is sometimes cited as a “national unemployment black spot”. 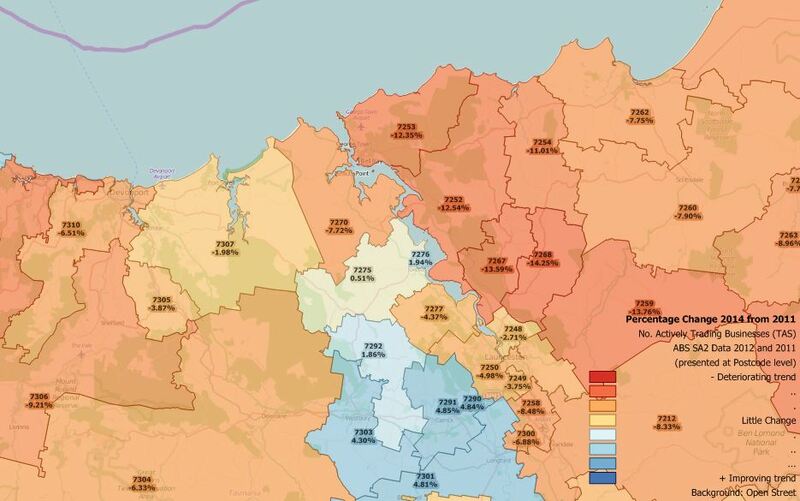 The following maps show the mixed fortunes of the region, on an annual basis since the current format business count figures were first collated for the four year period 2007-2010, published by the ABS 2011. 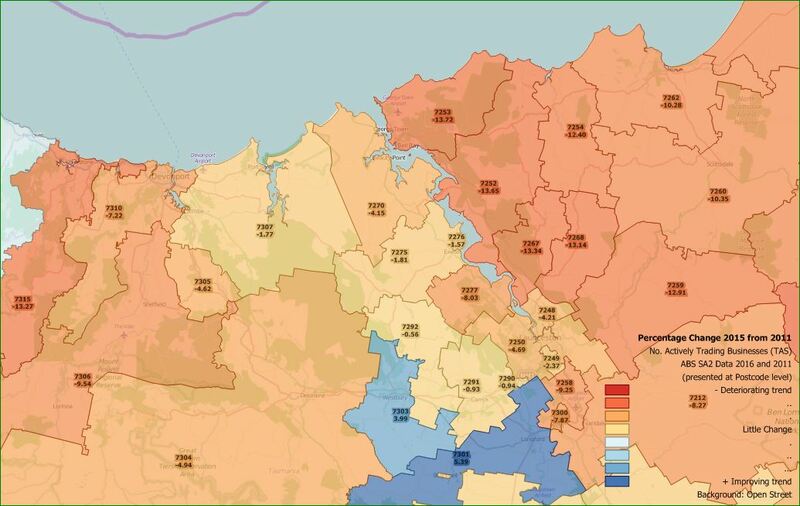 The first map shows the actual average number of all operating businesses for each postcode for the initial four years – this is the 2011 base line from which subsequent departures will be calculated. The first update, published 2012, shows some positive business activity (blue shades) which may have related to the construction phase of the new Meander Dam and resulting expansion of agricultural irrigation schemes (which could be confirmed by further analysis of type of business activity – contact us for more details). 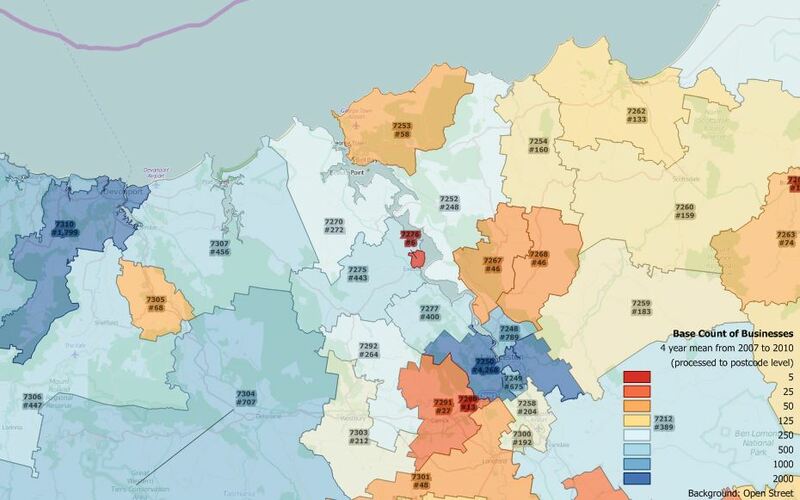 Average number of actively trading businesses per postcode for the postcode areas visible in the map declined by -3.42%. The figure for all Tasmania over the period was a -2.5% decline. The map below shows how the situation has changed over the four year average reporting period twelve months later, published 2013. In this more recent analysis, some postcodes previously exhibiting business growth have either stopped growing or have slipped into decline. The overall level of business activity, and thus general employment opportunity, is exhibiting a downward trend. 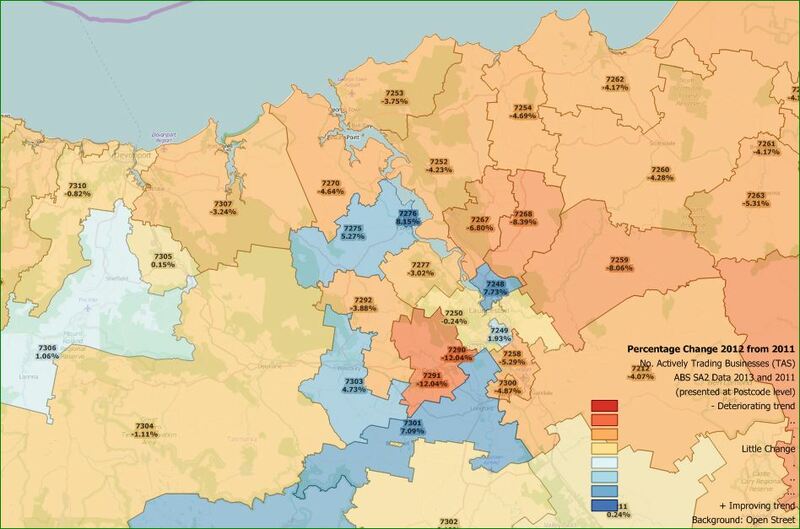 Average number of actively trading businesses per postcode for the postcode areas visible in the map declined by -5.14%. The figure for all Tasmania over the period was a -4.71% decline. Hopefully this situation will change when we perform an update mid 2015, following release of the 2013-14 data. Update 2015. Here are those results. The growth of the irrigated agriculture service sector seems confirmed, as does the continuing decline of (probably) timber and manufacturing sectors. More detailed insights into the types of business doing well and not so well are illustrated on our main business activity page. 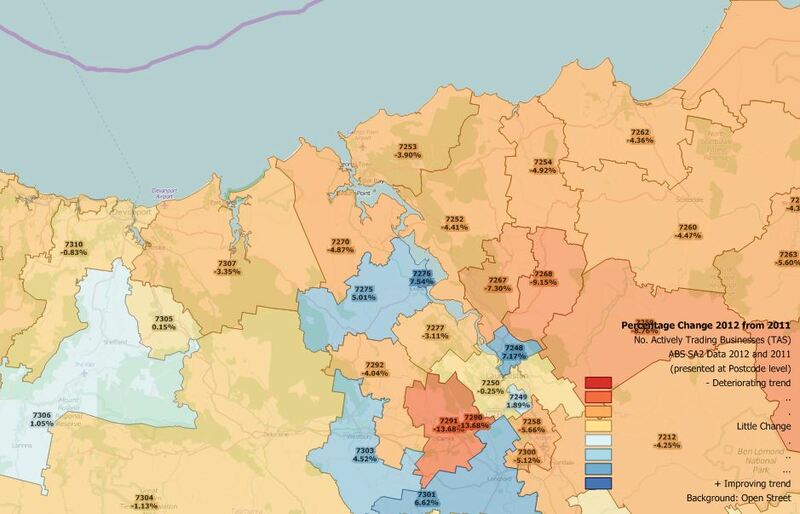 Average number of actively trading businesses per postcode for the postcode areas visible in the map declined by -5.48%. 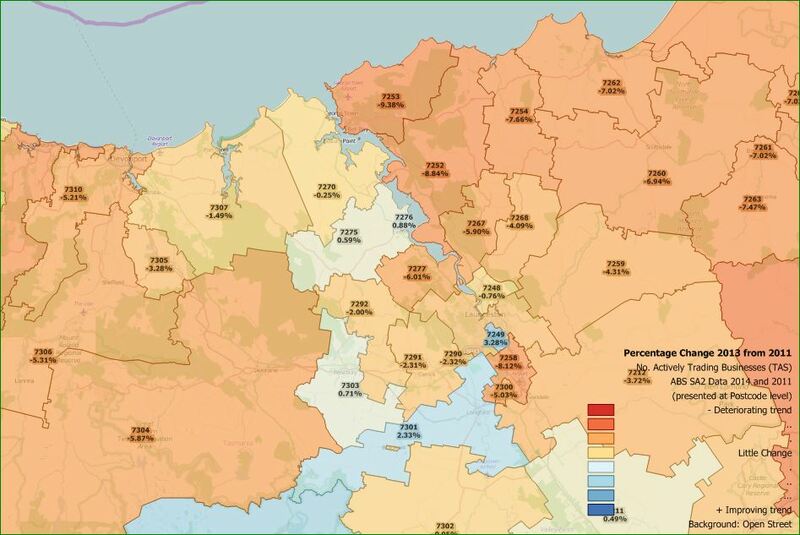 The figure for all Tasmania over the period was a -6.36% decline. More recent unemployment figures (rather than the number of operating businesses illustrated) suggest a more optimistic trend, hopefully these will be reflected in the next business activity figures when we update in 2016. Here are the data updated from ABS figures published mid 2016. Compared to the Sydney and NSW figures published in this blog, these numbers are unlikely to be masked significantly by population growth. Irrigation based agriculture in the Longford / Westbury region continue to grow, but little respite in the forest and manufacturing sectors which have traditionally underpinned the local economy. For the whole state, business activity has declined -6.71% from the 2011 base compared to -4.71% for the previous reporting period. Manufacturing and mining have both witnessed closures and presumably the consequent loss of supporting businesses and contractors. Improvements in tourism have offset this slightly. For the postcodes visible in the image total operating businesses declined -6.41% compared to -5.14% for the previous reporting period. For the whole state, business activity has now declined -6.88% from the 2011 base compared to the previous reporting period. Compared to the Sydney and NSW figures published in this blog, these numbers are unlikely to be masked significantly by population growth. Floods during winter 2016 in the Westbury / Longford district perhaps put a damper on the local economy reversing the earlier growing trend. It looks as though there has been a tourism related boost in the north east of the state where new outdoors based activities including mountain bike and walking trails have opened, but a lot of retail space in the regional centre of Launceston remains empty, though business seems to be picking up in the suburbs. For the postcodes visible in the image, total operating businesses declined -3.65% , an improvement from the pattern of recent years when compared to the 2011 base line. Tourism has been growing strongly and new businesses are taking advantage in popular holiday destination postcodes. 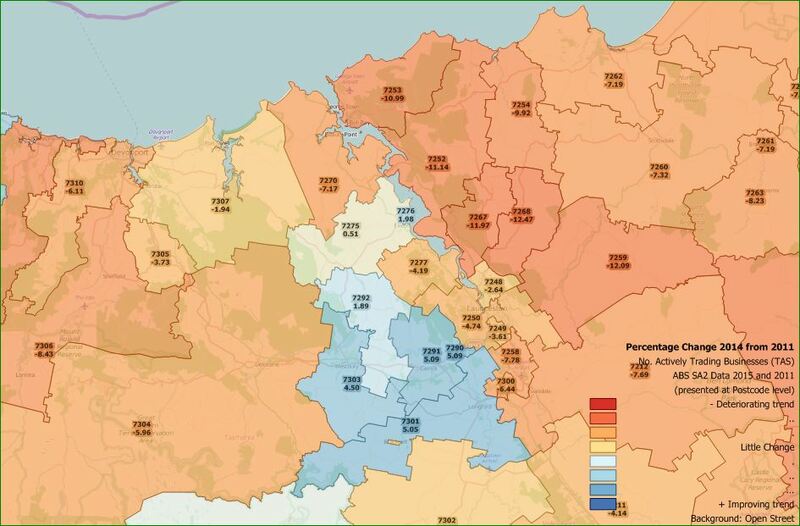 The image above analyses trends at postcode level for the six year period from 2011 to 2017. For the whole state, number of operating businesses were down -2.61% from the 2011 base. 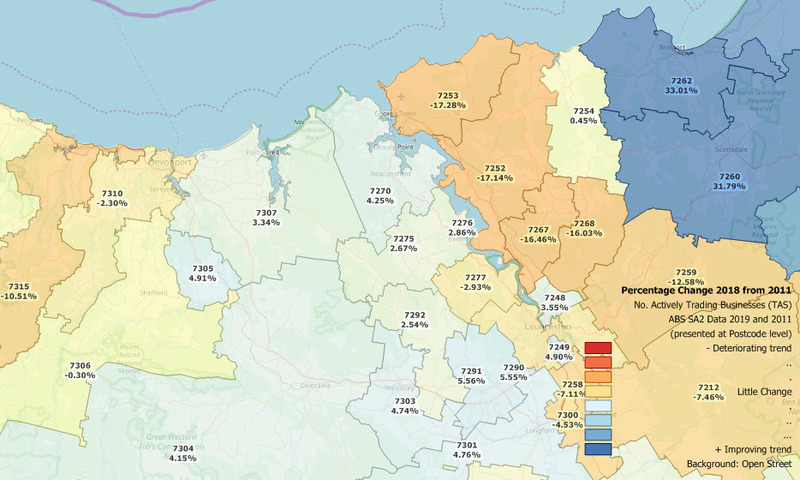 For the postcodes visible in the image, that number is -0.46%, the northeast is now doing relatively well. Analysis of the four year business count averages up to 2018 (released February 2019) show consolidation of tourism destination businesses and some recovery in general, possibly associated with an increase in refugee settlements. For the whole state, number of operating businesses were down 0.81% from the 2011 base – almost recovered! 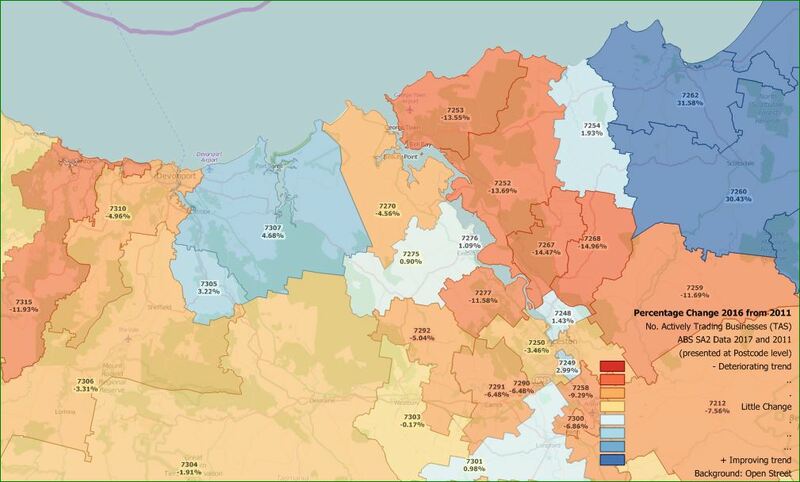 For the postcodes visible in the image, that number is +1.16%, the northeast now may be on the verge of boom times! Watch this space for next year’s updates! As we point out in the main Business Count post, these figures should be seen in the context of changes to population and GDP figures over the same period. With almost zero change to population, this region should have a limited business growth rate serving the resident population, but the substantial lift in interstate and international tourism has created significantly more opportunites for local business, especially in popular destination postcodes, the north east really does seem the place to be!